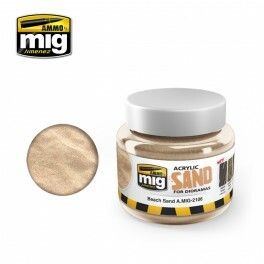 Acrylic Sand for Dioramas 200mlAMMO has created this new sand texture with a unique and distinct formula. It allows us to produce stunning finishes, almost lifelike in nature, for our dioramas, small scenes, and vignettes.. The product is ready to use and has an acrylic base, which makes it easy to use. It can be applied to small and large scenery surfaces using very different styles of tools and can also be mixed with other materials like pigments to create amazingly realistic effects. Ideal texture for a range of scales from 1/16 to 1/72. If the effect is deemed to coarse, you can lightly sand the surface once the product has dried, easily creating the desired effect.Water soluble, odorless, and non-toxic.